Our Adept Cloak is made for adventure. Perfect for infiltrating a mob boss’s headquarters on a desert planet, trekking across vast terrains on an important quest, attending a lavish party full of night creatures, or just for a fancy perambulation. Appropriate for Rangers, Force-sensitive Adepts, Vampires, Steampunk aeronauts, and so many more. 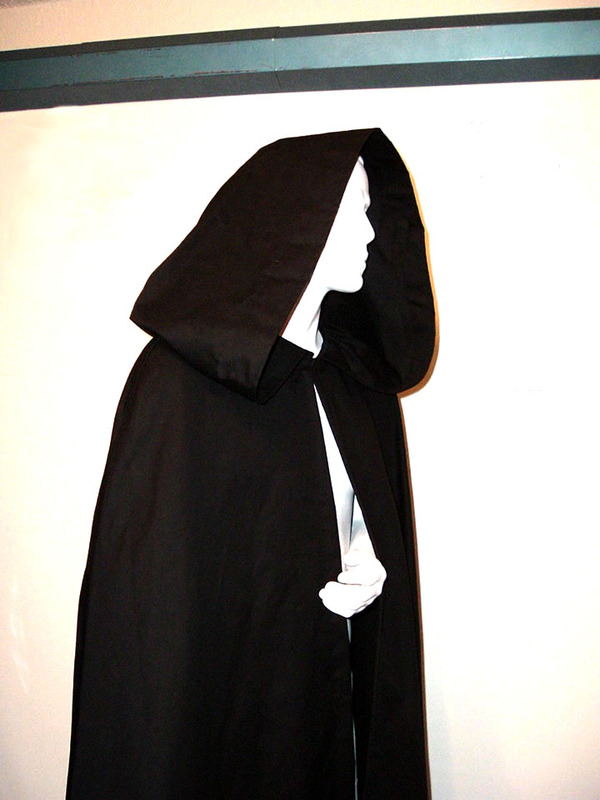 This cloak is full length with an impressively full hem and extra large hood make for a sweepingly dramatic entrance to any event. This cloak, as opposed to our robes, has no sleeves. Bottom weight cotton blend twill fabric gives them great drape AND washability. The fabric has a tight weave meaning this is no thin, see-through garment. Depending on size each robe weighs between 2.75-3.5 pounds. That's 1.25-1.6 kilograms for you International types. Closure choices include traditional ties, hook and eye fasteners, or we can leave it blank for your own cloak clasp. Be sure to specify when you order. You can choose between Black and Deep Brown. If you are interested in another color, contact us and we will try to accommodate you. Extra large and tall? No problem! This cloak is custom made for your size. No more drafty ankles. 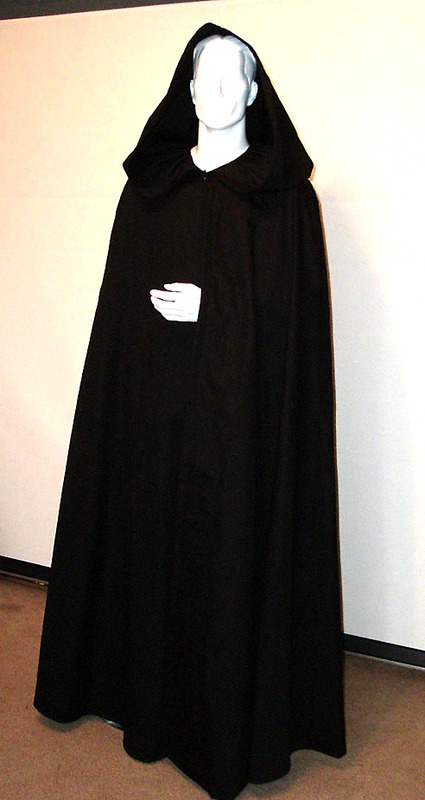 Versatile cloak with a full length and plenty of sweep. Perfect for rescuing your friends from a diabolical slug lord. 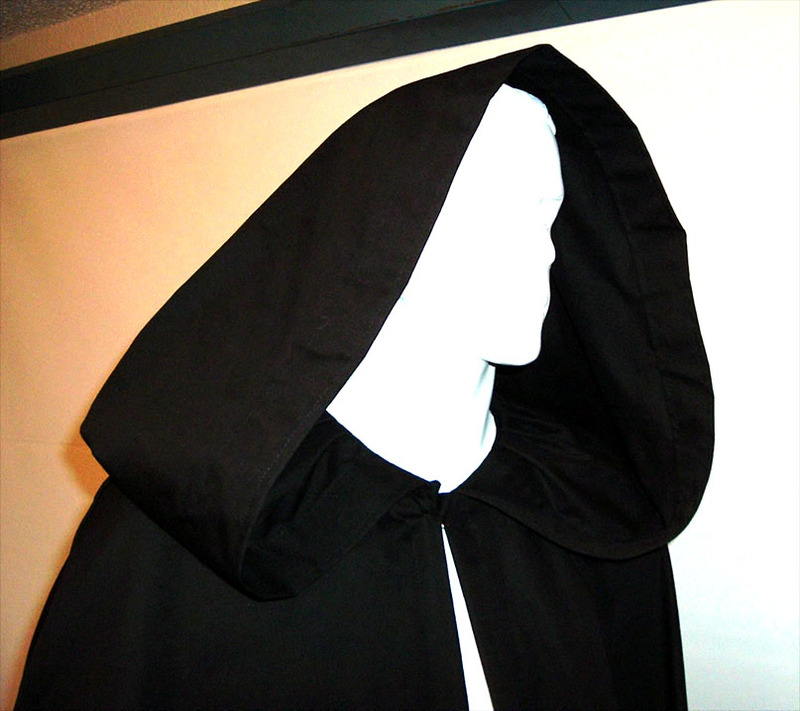 Extra large hood and a hem that floats an inch from the ground.